WASHINGTON -- US President Donald Trump on Monday signed a defense authorization bill that restricts any drawdown of American troops in South Korea. The John S. McCain National Defense Authorization Act, which approves $716 billion for defense in fiscal year 2019, recently passed both chambers of Congress and was sent to Trump to sign into law. 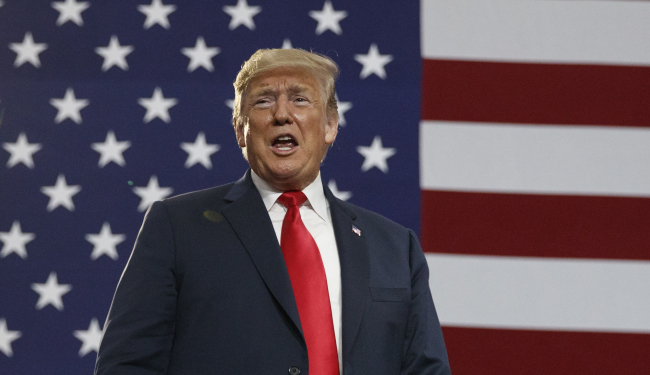 At a ceremony at the US Army's Fort Drum base in New York, Trump touted the bill as "the most significant investment" in the country's military in modern history. He also celebrated the return of the remains of some American soldiers killed in the 1950-53 Korean War. "Now these Americans heroes are finally starting to come home. They will be laid to rest on American soil. We believe in 'No American left behind,'" Trump said. The returns were repatriated from North Korea last month under an agreement reached by Trump and North Korean leader Kim Jong-un at their historic Singapore summit in June. Under a section describing the Sense of Senate on US military forces on the Korean Peninsula, it says their "significant removal" is "a non-negotiable item as it relates to the complete, verifiable, and irreversible denuclearization" of North Korea. Kim committed to the complete denuclearization of the Korean Peninsula at his summit with Trump, but experts say progress on implementation has been slow. The restriction comes as Trump has repeatedly indicated a willingness to eventually pull out American forces from South Korea. Critics say such a move would play into the hands of China and North Korea, which wish to see US troops removed from near their border.